It seems hard to believe now, but until my first visit to an art museum, I didn’t understand why Van Gogh was considered a great artist. I had never been exposed to art…never visited a museum…never taken any art classes in school. Better late than never, in my mid-twenties my first art museum visit was to the Honolulu Academy of Art (now the Honolulu Museum of Art). I don’t recall what motivated me to go there but it was an electrifying experience. The first gallery you saw upon entering was the museum’s modern collection, including works by Monet, Modigliani, Gauguin, Picasso, Braque, and others. 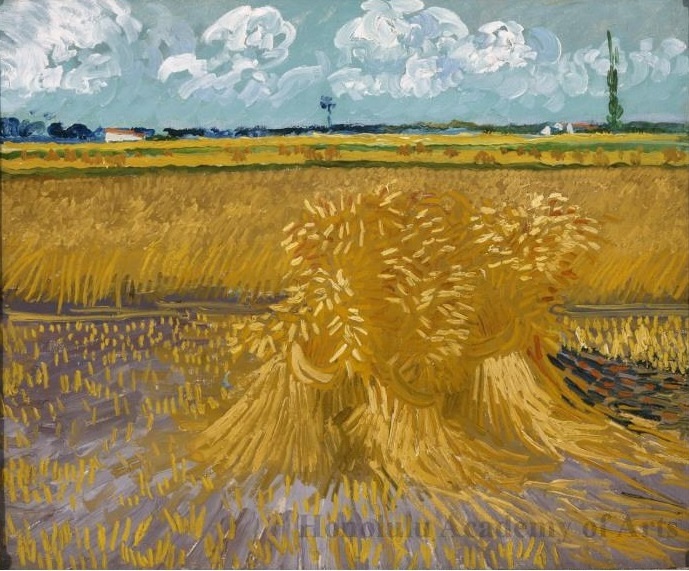 Among these works, the Van Gogh leaped out with its bright yellow wheat field. Wheat Field by Vincent Van Gogh, June 1888, oil on canvas, 55 x 66 cm. ; Honolulu Museum of Art. The emotional nature of Vincent’s paintings, expressed through his brilliant use of color, the thick impasto of paint laid down in visible strokes, not to mention his masterful drawing, evoke a response in me that few other artists do. During Van Gogh’s relatively short and troubled life (1853-1890), there was a period when he felt called to the ministry and wrote to his brother Theo, “I suppose that for a `sower of God`s words`, as I hope to be, as well as for a sower of the seed in the fields, each day will bring enough of its own evil, and the earth will produce many thorns and thistles.” He failed at ministry and decided to become an artist. 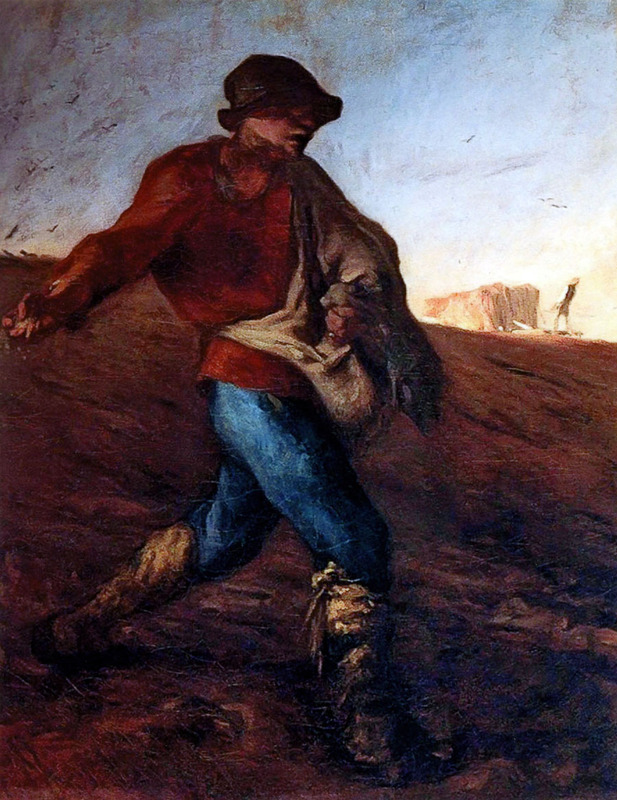 The image of the sower would be a recurring theme in his work. He was inspired by this 1850 painting by Jean-François Millet. When Millet painted this work it was quite novel for an artist to depict poor or working people, a subject considered beneath the dignity of fine art, or best left relegated to part of the picturesque background. Millet, however, painted them in a heroic manner, bringing them close to the viewer and depicting their toil in a rough yet ennobling manner. Vincent was an avid admirer of Millet, describing his works as “something on high” with religious feeling. In addition to making his own copies of Millet’s work, in June 1888 Vincent painted this Sower at Sunset, which he told his brother was “a failure” though to us it may seem an incandescent glory. In November he painted another version, this time bringing the sower close to the viewer, adding a greenish sky, a tree to balance the figure, and the setting sun as a halo behind him. The halo lifts the humble sower to an eternal figure and also makes explicit his link to the parable told by Jesus. Seeing this reading in the lectionary today naturally reminded me of Vincent’s paintings. Surely his work has sown fruit a hundredfold, though he died penniless and unknown. Despite his severe emotional problems, he responded to the promptings of the Spirit and produced a staggering array of paintings that lift the souls of those who view them. His furrows were certainly sown deeply. My chance museum visit in Honolulu that day sowed the seeds in me of the love of art. When I left the museum I immediately went to the public library and began checking out books about the artists whose works I had seen that day. It took many more years until I started college to pursue my love of art history. In hindsight, I can see how God was sowing seeds throughout my life but I often didn’t recognize them. Can you look back and see the seeds in your own life? Luckily our Sower is generous with his seed, casting many more than will take root. How can we dig deep in our own lives to ensure that the seed in us is planted firmly? This entry was posted in Art, Faith, Religion and tagged art, art history, Bible, Catholic, Christian, contemplation, faith, scripture, Sower, Vincent Van Gogh. Very interesting post. When I saw the “secular” painting I wondered how you were going to relate it to Biblical references which you generally do so well. I assumed this post would have a different focus. But you so expertly brought in the parable of the sower and further related it to sowing the seeds for your love of art, and then our responsibility as the recipient of the sower’s seeds. Really well done. i feel that I have learned so much from your posts..
About a year ago, we visited the Philips Collection in Washington, D.C. for an exhibit they had on Van Gogh’s paintings. I am mostly familiar with is later works, you know, those swirly night sky and golden piles of hay. This exhibit followed his progression, highlighting his meticulous attention as he made variations on the same image, whether landscapes or portraits. Part of his early study was to copy artists’ paintings, lithographs, etc. to understand how they drafted their images. One room of the exhibit had these other artists’ works, which were repeated by Van Gogh in later rooms. One of the images (I do not recall the artists, though) was of a sower. 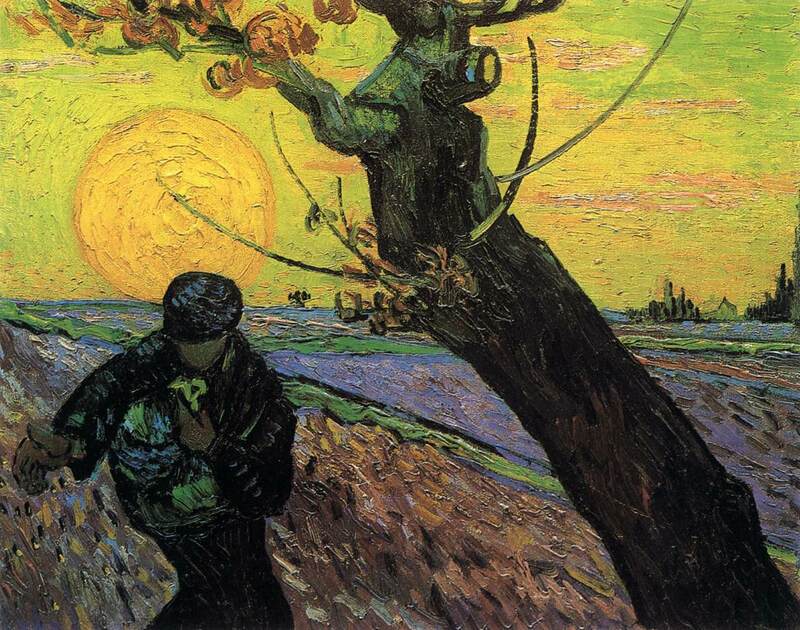 Just as your imagination was captured by that composition and sermon of the sower, so was Van Gogh’s by another artist’s representation of the idea. My inner art historian enjoys finding these direct, and indirect, pathways from one generation to another. Yes, what Van Gogh did in copying others’ works was (is?) standard training for an artist at that time. You can still see artists in museums today with their sketchbooks or their easels, imitating the works of the masters to learn from them. 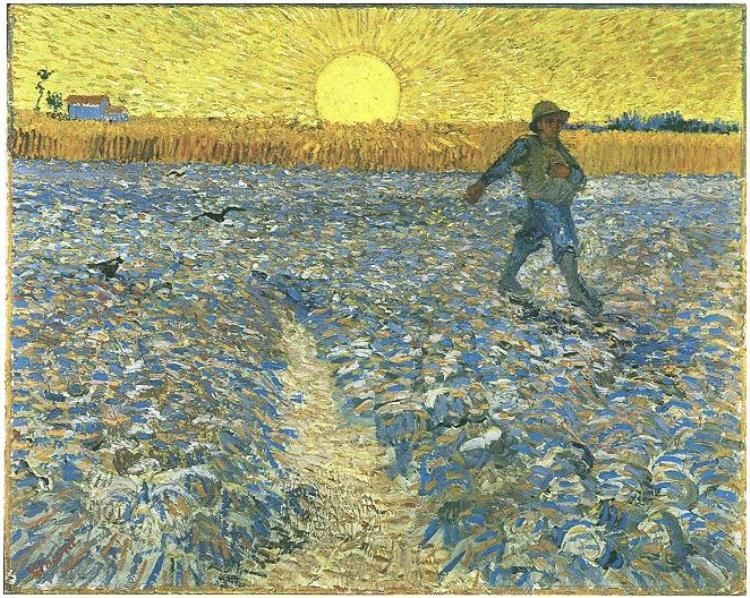 I think the Sower he copies is Millet’s, as I wrote in my post, though there may be another that wasn’t mentioned in my book on Van Gogh. So Wonderful Jane 🙂 Articulated the main reasons I also love Van Gogh’s work – powerful abilities to communicate through emotive colour use, expressive line, superb draughtsmanship… Beautiful to include a related bible passage. To understand Van Gogh you should read his letters – if you havent already that is! They are among the most moving letters ever of any artist and also describe waht he was aiming at in his paintings.